This is just one of the ideas that physicists are pursuing in the quest to solve the mystery of dark matter. I love the idea of dark matter. For me, it's the ultimate enigma. I mean, our universe contains protons and neutrons and electrons, and that's great. All this 'normal' matter is the basic ingredient for everything from Brad Pitt to intergalactic gas clouds. Normal matter also exerts a gravitational force, and this is also great. Gravity stops my coffee from floating away and prevents galaxies from spinning apart. But when you add up all the particles in all the galaxies in the universe, there just isn't enough to produce all the gravity in the universe. There's way too much gravitational force and way not enough matter. For our universe to make sense, it needs a whole load of something extra to make up the gravitational shortfall. That something extra turns out to be up to 80% of the matter in our universe. We call it 'dark' matter: particles we can't see and don't understand but that bring enough gravitational force to balance the books. 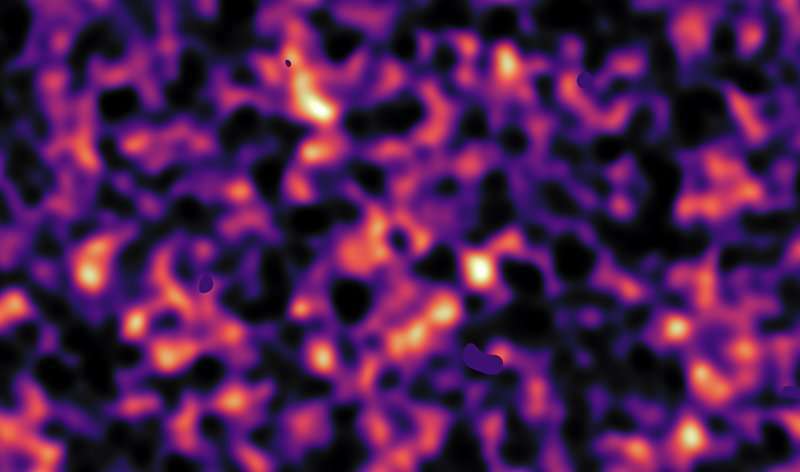 We've been searching for direct evidence of dark matter for years but found nothing. Not to worry: we knew it would be tricky. Researchers believe dark matter pretty much ignores normal matter and light. "Dark matter particles could be everywhere around us, but they just don't interact electromagnetically," says Vid Iršič, a University of Washington researcher and dark matter expert. "They could only interact gravitationally." Though it sounds strange, there's already precedent for particles that don't play well with others. They're called neutrinos. "Neutrinos are very, very light particles that interact very weakly," says Vid. "They come from the stars. Neutrinos from our Sun pass through Earth in their billions every second, across every square centimetre." These particles are passing through you right now, but their interactions are so mild you don't feel a thing. Yet neutrinos are like big brass bands compared to dark matter. So what are dark matter particles? There are loads of theories and experiments searching for many different particles in the race to solve the dark matter mystery. Below we outline Vid's personal top five dark matter candidates, from most likely to least likely. Thinking caps on. Weakly interacting massive particle is a catch-all term for a bunch of particles that fit that description. 'Weakly interacting' means they don't interact much with normal matter or light. 'Massive' means they're larger than the mass of a proton. WIMPs are popular because they've been independently predicted by a few different particle physics theories. And because of the WIMP miracle. The miracle is that these theories also predict the total mass of WIMPs, and it's approximately the same mass as that required to explain all the extra gravitational force. Coincidence? Perhaps not. If axions do exist, they'd also tick some dark matter boxes. They're predicted to interact only weakly with ordinary matter and light. And they'd be just the right size for us to have missed them (so far). (That size, in case you're wondering, is somewhere between 2 and 100 micro-electron-volts (and a micro-electron-volt is 1.78×10-42 kilograms). Axions are also super-amazing. One axion decays into two photons. Plus you can make an axion by combining two photons. We're hoping this will help us detect them some time soon. In April, Vid's university announced it can now search more sensitively than ever before for signs of axion decay. This candidate is a relatively new kid on the block. It's also known as ultralight axions, fuzzy dark matter or wave dark matter. If it exists, it's super-duper light, something like 10-22 electron-volts. And because it's so light, it behaves in a way that suits string theory and quantum mechanics. The idea is that, when you get a whole galaxy-load of these particles together, they behave more like a wave than a spinning ball. You end up with miniscule particles that combine into a wave that spans thousands of light years. No wonder they're tricky to find. Dark matter could also be a special form of neutrino, which is tricky, because neutrinos are already special. They come in different flavours (electron, muon and tau), and they can shift between flavours as they travel through space. Plus, they're minimally interactive and super-light. Dark matter neutrinos, if they exist, are the neutrino's much heavier cousin. Called sterile neutrinos, they're predicted to interact with normal matter only when they flip between flavours. This is an increasingly popular option. What if there isn't just one type of dark matter particle, but many? Just as normal matter has a whole bunch of different particles, so too could dark matter. But because normal particles and dark particles don't interact much, we may never know. Perhaps the only way we could observe these particles would be indirectly, through their gravitational effect on the evolution of the cosmos. Thinking caps exploding. "This is quite fascinating," says Vid, in what could just be the world's biggest understatement. "More and more people believe that dark matter is not just one particle but a collection of particles, perhaps in a mirror image of the world we know. The standard particles that we know, but disconnected from us except for gravity and not interacting with us in any other way." Will we ever discover what dark matter is really made of? Well, we're going to give it our best shot. Thousands of scientists around the world are searching for signs, trialling new ideas and developing mind-blowing technologies. We used to think the world was flat. And that our universe was visible. What will the next decades bring? ...A galaxy's halo is displaced dark matter. I'm not sure how it would be displaced except maybe through BB turbulence. Anyway it is a low density region of the dark energy. Which is what matter is, actually. Matter coming in two forms - quantized (particulate) and continuously distributed gradients in the dark energy density. The gravitational effect is the same under expansion. That is galaxies tend to form in low pressure regions of the dark energy. The acceleration of gravity is actually less inside galaxies because of the lower dark energy density. This is where most galaxies tend to form. If you want to see the curvature of spacetime you look at curves on surfaces of regions of similar dark energy density or similar gravitational acceleration. Around regions of matter where the dark energy density is lower the speed of light slows down. That is it takes longer to get from point a to point b because the distance between point a and b is further when the dark energy density is lower. So a wave front approaching an object will be slowed down closer to the object causing it to bend in toward the object. Effectively the index of refraction around the object is higher so it appears as a convex lens. At least it seems that way.